The vulture is a large, carnivorous bird that is most well known for its scavenging nature. Vultures are pretty flexible when it comes to their habitat, as long as there is food, although you won’t find them in Australia, polar regions, or most small islands. These unusual birds are divided into two groups: New World vultures, which are from North, Central, and South America; and Old World vultures, which live in Africa, Asia, and Europe. 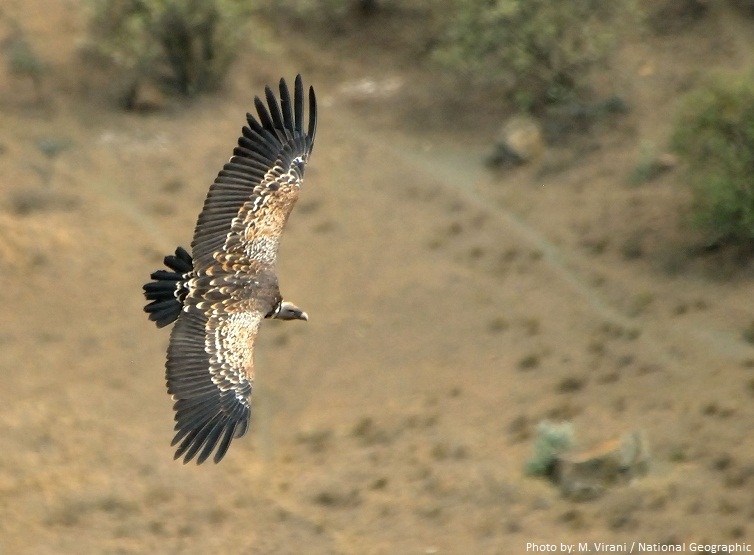 There are 7 species of New World vultures include Andean condors, California condors, and the 16 Old World species include the lammergeier and griffons. New World vultures and Old World vultures aren’t actually closely related. 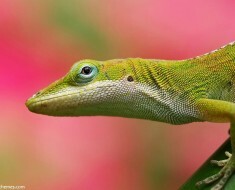 They’re similar because of what’s called convergent evolution: They have developed similar bodies and behaviors because they occupy the same ecological niche. 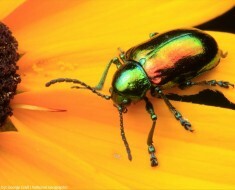 Life span is from 10 to 50 years, depending on species. The largest is Himalayan griffon (Gyps himalayensis), up to 1.5 meters (4.9 feet) tall with a wingspan up to 3.1 meters (10.2 feet). 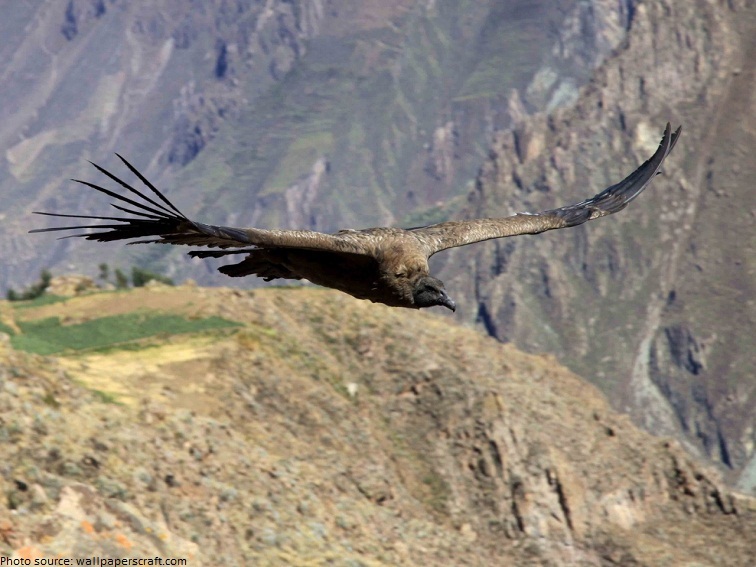 The heaviest is Andean condor (Vultur gryphus), up to 15 kilograms (33 pounds). The smallest and lightest is palm-nut vulture (Gypohierax angolensis), 60 centimeters (2 feet) tall and weight up to 1.7 kilograms (3.7 pounds). 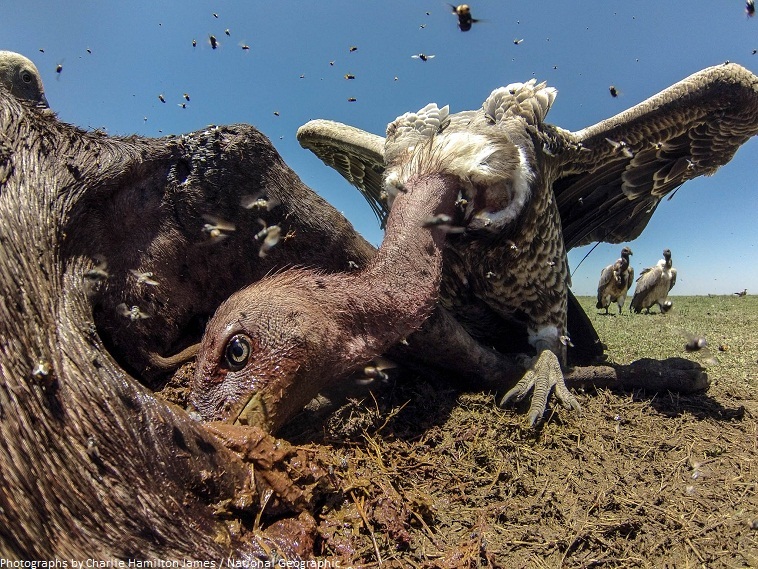 Vultures are built for their messy job. 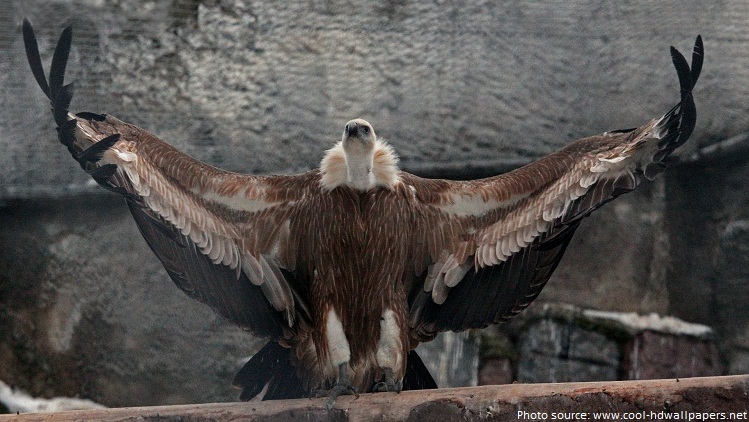 All vultures have a wide wingspan, which allows them to soar for long periods of time without flapping so much as a feather while looking for carrion (dead or decaying flesh) to eat. 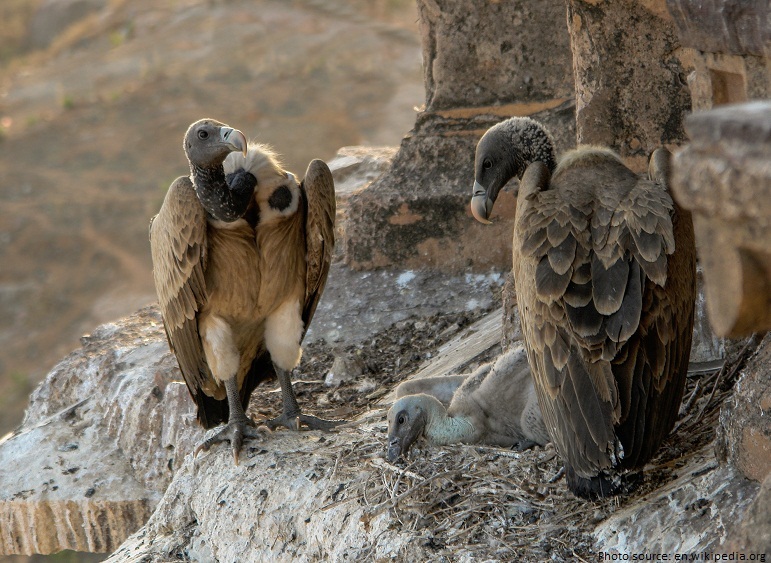 Most vultures have a large pouch in the throat (crop) and can go for long periods without food — adaptations to a feast-or-famine scavenging lifestyle. Vultures have strong and curved beaks for ripping apart meat. They have bald heads and usually don’t have feathers on their necks, either. Bare skin in those areas helps the birds stay cleaner when they stick their head into a carcass to feed. 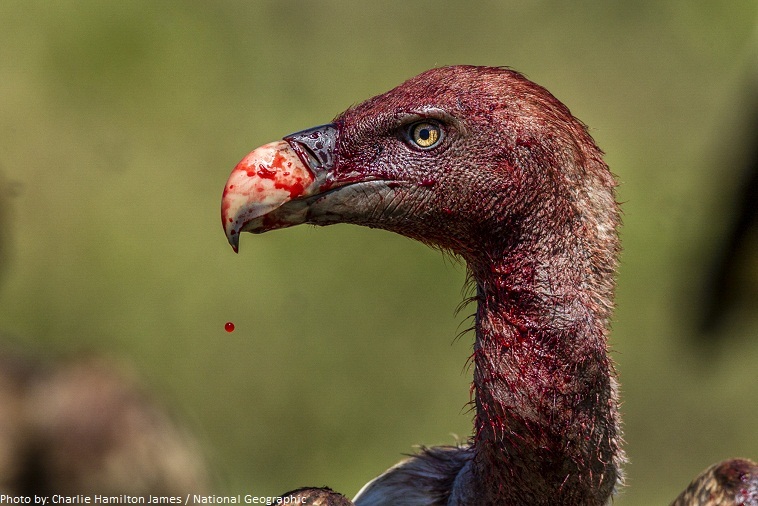 With no feathers to trap gunk on a vulture’s head, meat and blood just dry and flake off. 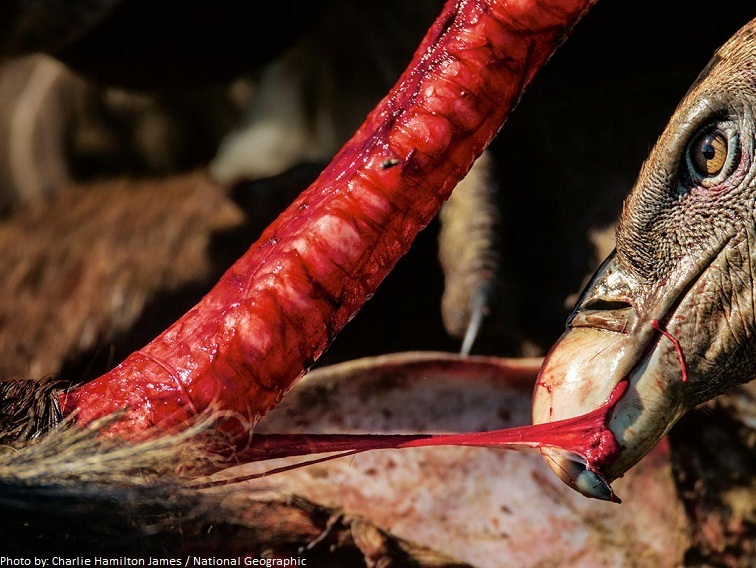 A strong immune system allows vultures to eat rotting and possibly infected meat without getting sick. 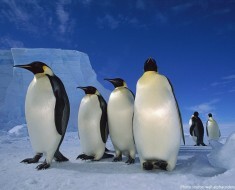 These birds play an important role in nature by cleaning disease out of the environment. 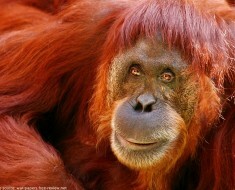 This helps protect other animals and people from getting sick. Vultures have keen eyesight. 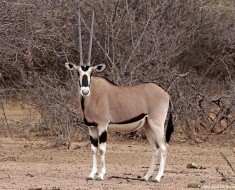 It is believed they are able to spot a one-meter (3 foot) carcass from four miles away on the open plains. In some species, when an individual sees a carcass it begins to circle above it. This draws the attention of other vultures that then join in. While New World vultures often have very keen senses of smell, their Old World counterparts aren’t as lucky. New World vultures are frequently attracted to mercaptan, a gas that rotting corpses release and that they find very appealing. 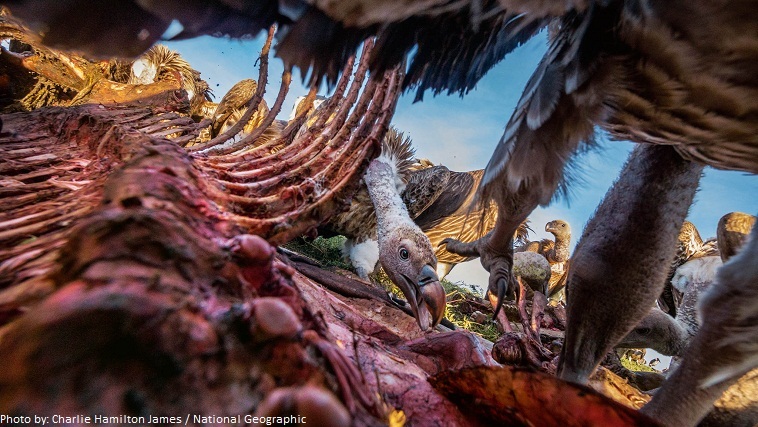 Although vultures generally don’t kill their own meals, there are a few exceptions. They sometimes go after animals feeble from injury, or defenseless youngsters. They sometimes even go after particularly tiny animals, like mice. Unlike many raptors, vultures are relatively social and often feed, fly or roost in large flocks. A group of vultures is called a committee, venue or volt. In flight, a flock of vultures is a kettle, and when the birds are feeding together at a carcass, the group is called a wake. Although New World vultures are unable to make more than hissing and grunting sounds, Old World vultures can be quite vocal when feeding at a carcass, making lots of grunts, screeches, croaks, and chatter. Old World vultures have relatively strong feet, but New World Vultures have flat, weak feet that are poorly adapted for grasping. Vultures try to attract a mate by soaring in the sky around each other. The male shows off his flying skills by almost touching the female’s wing tip as he flies by to impress her. Normally, vultures are social birds that hunt in flocks, but when it comes to starting a family, they pair for life. 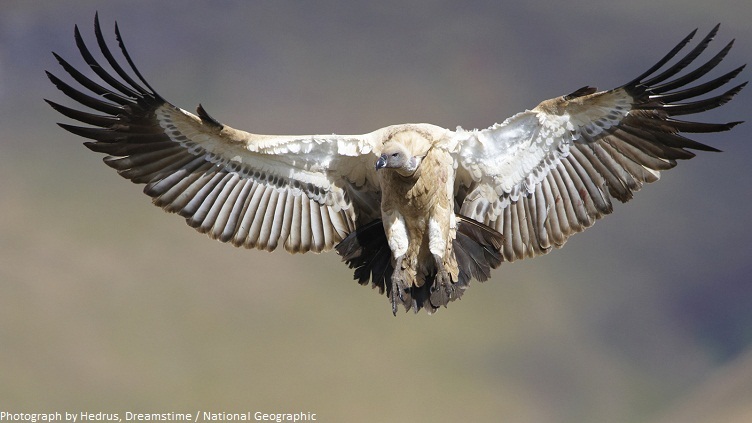 Old World vultures build large stick platform nests in trees or on cliffs, sometimes in large colonies. 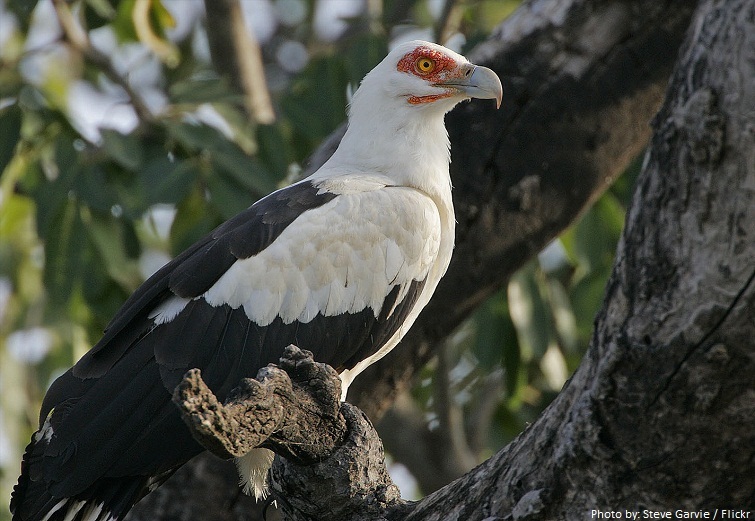 New World vultures do not build nests but lay their eggs in bare scrapes in natural cavities in cliffs or trees. smaller vulture species. The parents take turns keeping the egg warm and feeding the chicks when they hatch. When the chick is young the parents pick up small pieces of meat and feed them to the chick, but as it gets older, it picks up these regurgitated food items on its own. Chicks remain in the nest for 2 to 3 months and continue to depend on their parents for a period of time after fledging, until they learn how to find and compete for food on their own. By the time they are ready to fledge, at 3 to 6 months old, the chicks are nearly the same size as their parents and are fully feathered, but their coloration is different. 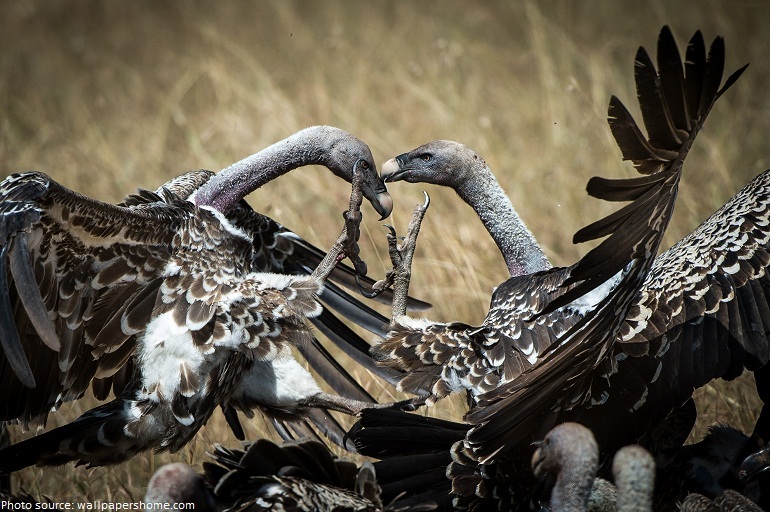 A group of 100 African white-backed vultures can strip a 50 kilograms (110-pound) carcass in 3 minutes. The large crop of a Rueppell’s vulture can hold about 1.5 kilograms (3.3 pounds ) of food, which may be as much as 20% of the bird’s weight. When a vulture is upset, its head turns red, and it looks like it is blushing. 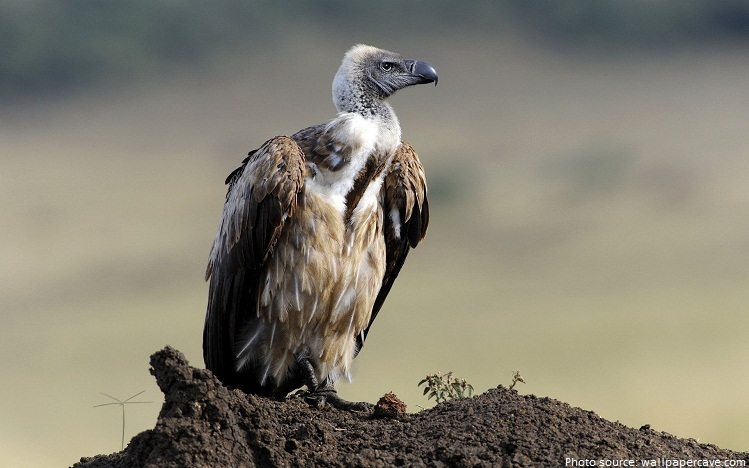 Old World vultures may play dead when threatened, hunching down or hiding in a nest. 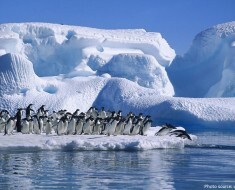 Thermal winds help them to achieve altitude and to fly a long period of time without flapping with its wings. Ruppell’s griffons get on the wing about two hours after sunrise and spend the entire day aloft. The Rueppell’s vulture is the highest-flying bird. Reportedly, one was hit by a jet flying over the Ivory Coast at an altitude of 10,800 meters (35,433 feet). More recently it has been suggested that bald heads serve to help vultures regulate their body temperature when moving rapidly from cold air to warm air when they descend from cold, high altitude air to warmer air near the ground. Many people look at the vulture as a sign of death, but some cultures admire the birds. The Egyptian Vulture was the sacred animal of the ancient Pharaohs; its appearance is immortalized in the Egyptian hieroglyphic alphabet as the letter A. 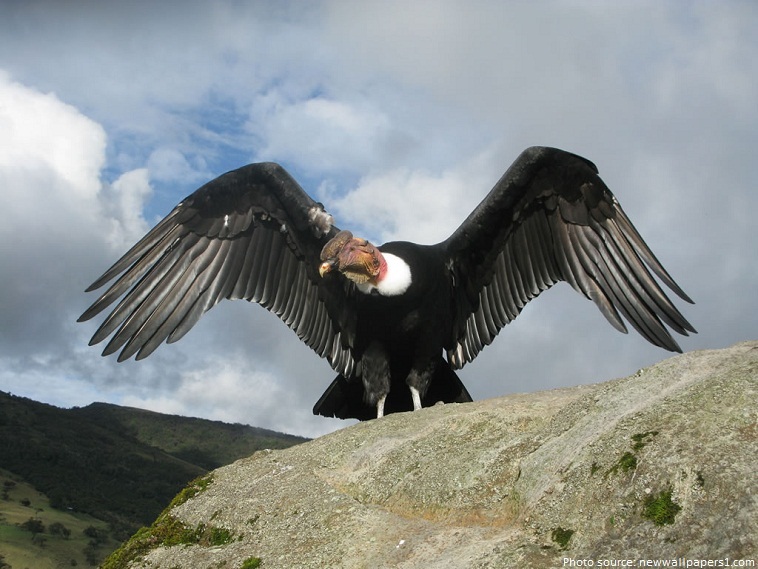 In Native American culture, California condors are important in mythology and burial rituals. Tibetan sky burial is a ritual that has great religious meaning.In this ritual bodies are chopped up and fed to the vultures. 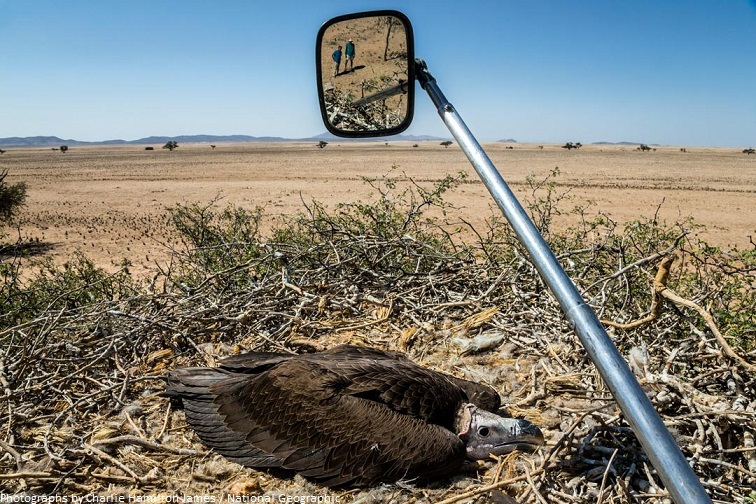 Aside from poisoning – both targeted and incidental – vultures are threatened by wind turbines, electricity pylons, habitat destruction, food loss and poaching.” Of the 23 vulture species of the world, 16 are considered near threatened, vulnerable to extinction, endangered or critically endangered.